LG recently submitted a “class 2 permissive change” to the FCC for Verizon’s variant of the G2, known internally as the LG-VS980. With the G2 launching on Big Red today, these last minute submissions are apparently typical. That said, there is nothing typical about this one, as it appears to be a screw-up either at the FCC or by LG. The documents are available for the world to see at this point, something that tends to happen once a phone is made available, but they do not show the LG G2 for Verizon. No sir, they show the LG-D820 in a variety of images, a device better to known to us as the next Nexus device or potentially, Nexus 5. 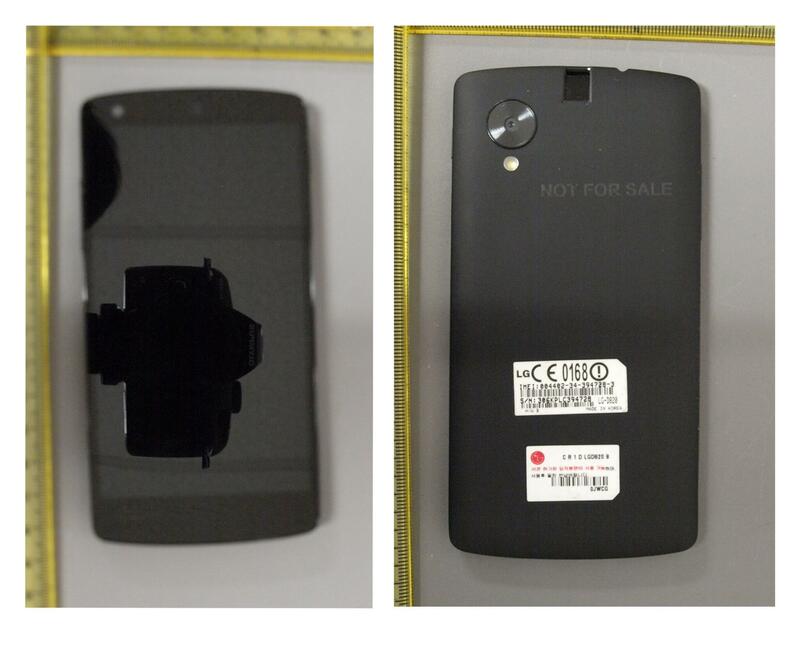 As can be seen on the lower white sticker in the top image, the model number shows as LG-D820. The actual images themselves depict a device that matches up exactly to the phone seen in a Googler’s hands during the Kit Kat unveiling, and also last week’s FCC docs for the LG-D820. We’ve already laid out our reasons to believe that this is the next Nexus, if you haven’t read it yet. We have a top left-positioned camera lens with flash below. 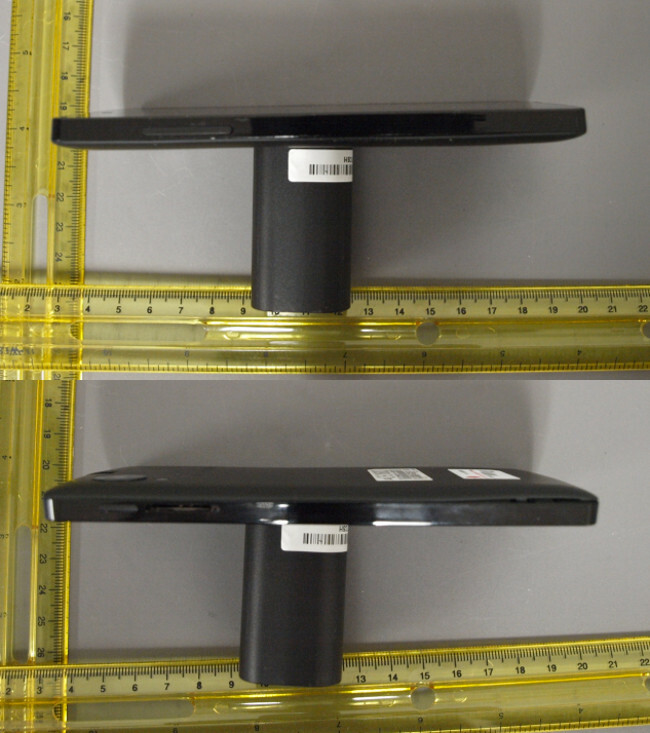 On LG G2 models (all of them), the camera is centered with flash, volume, and power located directly below it. As you can see in these images, the volume rocker and power switches are located in the more traditional spots on the left and right sides of the device. Again, this is clearly not the G2. 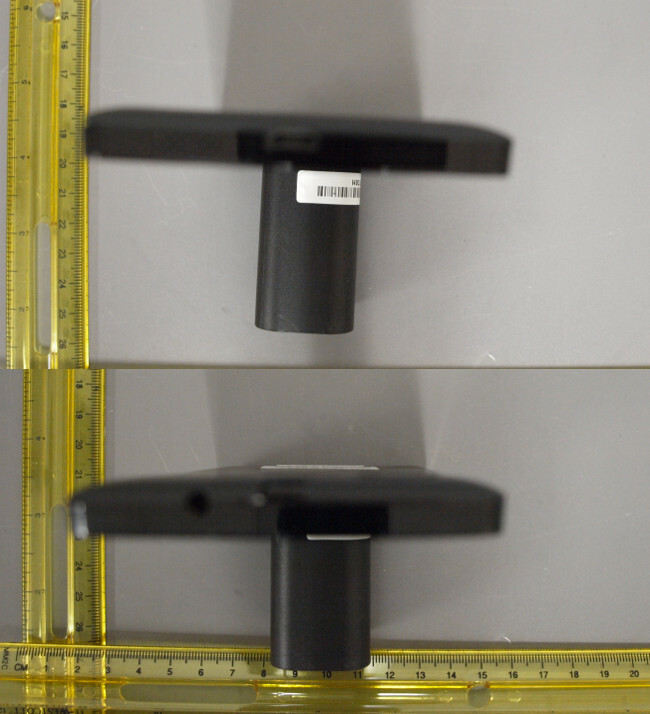 In the top and bottom shots of the phone, which are incredibly blurry, you can pick out microUSB and headphone ports. On the G2, you have microUSB and headphone jack both on the bottom of the device, not on opposite sides of each other like we are seeing here. Also, keep in mind that this looks like a very early prototype and by no means is a finished product. So no, that top notch is likely not a fingerprint scanner if that’s what you were thinking. If you look at the image below with the back removed, there is nothing underneath it from what we can tell. 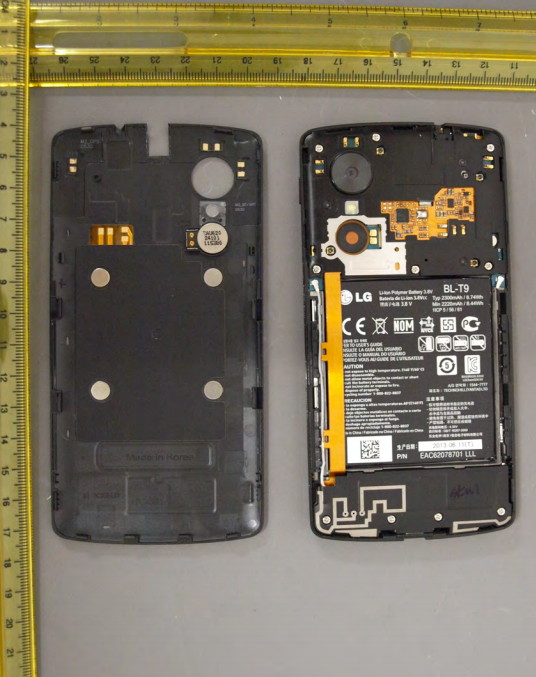 Oh, and this also does not mean that the back is removable – it’s simply the FCC digging under the hood. The 2300mAh battery is confirmed yet again, though. And is it just me or does this look identical to the shape of the Nexus 4? Thoughts?